This post is in direct response to a question I asked my readers last week. I asked what their favorite oil to cook with is. 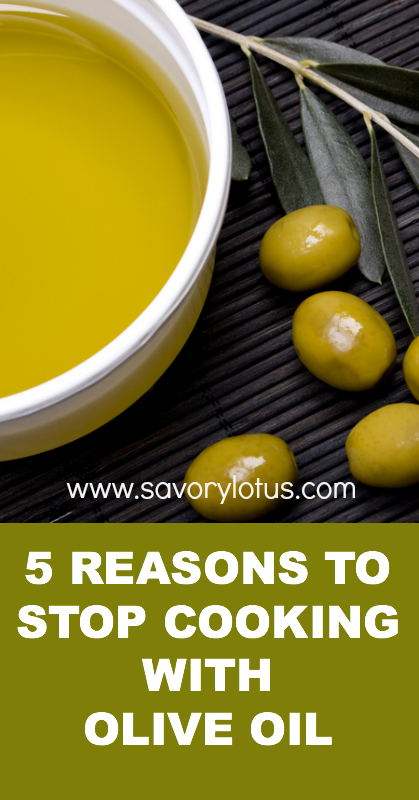 And I was surprised at how many folks responded with “olive oil.” So I just wanted to share a little of what I have learned along the way about cooking with fats. I’m not an alarmist. Nor do I believe that if you cook with olive oil that you are eating tons of free radicals that are going to kill you. I just think that there are better choices when it comes to cooking fats and oil. Leave your olive oil cold and unheated. It is my opinion that saturated fats are the best fats to use when cooking. This has to do with the molecular structure of oils. Saturated fats contain no double bonds so are not sensitive to heat, light or oxygen, unlike unsaturated fats. Unsaturated fats (vegetable oils) have double bonds, making them very sensitive to heat, light and oxygen. Heating these types of oils will change their molecular structure, destroying many of the healthy properties. Olive oil is made up of about 70-80% monounsaturated fat, in the form of oleic acid. This oleic acid is what gives olive oil many of it’s wonderful health benefits like improved insulin resistance, cancer-fighting properties, and improved heart health. It is also these monounsaturated fats that give olive oil a low smoking point, making it unsuitable for temperatures above 250’F (121’C). Olive oil has phenolic compounds, mainly hydroxytyrosol and oleuropein, that are rich in antioxidant properties. These phenols, which work as antioxidants to preserve heart health, begin to degrade at high heats. Olive oil contains both Omega 3 and Omega 6 Fatty Acids. According to Dr. Mercola, omega-3 fats are “significant structural components of the cell membranes of tissues throughout the body and are especially rich in the retina, brain, and sperm, in which docosahexaenoic acid (DHA) constitutes 36.4% of total fatty acids”. These fatty acids are sensitive to heat and are destroyed when olive oil is heated. I have not been able to find the exact temperature at which omega fatty acids are destroyed but find it a good practice to not heat them at all to preserve their nutritional value. 4. Low smoke point=breathing in toxic smoke. If an oil is heated beyond its smoke point, it gives off toxic smoke. Because olive oil has a low smoking point, cooking with olive oil runs the risk of creating smoke that contains compounds that are harmful to human health. You may not even notice that you are breathing in this toxic smoke. Many brands cut their olive oil with cheap oils like soybean oil, canola oil, hazelnut oil and low grade olive oils. A study by UC Davis in 2011 found that 73% of the 5 best selling imported brands of olive oil did not meet the international sensory standards for extra virgin olive set by European regulators. This meaning that they could be adulterated or blended with other vegetable oils such as soy, corn, cottonseed, hazelnut, or canola oil. So what I am saying is that the olive oil you are using may not be REAL olive oil and may contain heavily processed vegetable oils that contribute to inflammation in the body and are possibly GMO. YUCK! I have done a ton of research, and the only brand of olive oil that I buy is Kasandrinos. It is a small, family-owned business with high quality olive oil. Never adulterated. Always organic. Be sure to check out Kasandrinos HERE. Olive oil is a healthy and delicious oil. Just don’t use it for cooking. It is wonderful in salad dressings and dips and can be drizzled over already cooked vegetables. Read my post on Top 5 Healthy Fats in the Kitchen. The professional cooking community has be saying for a decade plus not to use Extra Virgin Olive Oil for cooking. If you want to cook with Olive Oil, there are last press oils that are more stable under heat. For those of us concerned about health, i think this is bad advice. I notice that there is no real detail concerning toxic smoke. This sounds like a typical ploy tp steer the gullable back to unhealthy cooking since some of these companies have seen profit loss. I came across this blog post and I had to leave a reply. I am an internal medicine physician in Houston, Texas, practicing outside of residency for 5 years now. I practice mainly hospital medicine and critical care. I have to tell you, I am deeply saddened at this misinformation. There have been countless studies dating back decades about the effects of saturated fat and atherosclerosis, peripheral arterial disease, cardiac disease, stroke, and cancer. Internists, cardiologists, bariatric surgeons, and many dietitians in the healthcare field will tell you that is it beyond clear the association exists between saturated fat and preventable disease. Please take this down or correct it, as many readers may actually take your advice as gospel. I see and treat these preventable diseases related to diets high in cholesterol and saturated fat everyday. I’m sure you would cringe if you knew your advice was potentially contributing to these silent killers. Please make sure your sources are reputable and backed by real science in randomized controlled trials in peer-reviewed journals. Thanks. Hello, Dr Wells.I am going to have to respectfully disagree with your comment here. When you talk about being backed by real science and peer-reviewed journals, I am going to have to ask you to take another look at the research that you base your ideas and beliefs upon. There is much recent evidence to debunk the old and outdated ideas that saturated fat and cholesterol are the big villains that they have been made out to be. Unfortunately, medical schools have not caught up with the currents thoughts. I am happy to share some information that you may find interesting on the subject. If you do not know who Chris Kresser is, he is a very respected and thorough researcher and practitioner that has been for years peeling back the truth on the subject. While I respect your desire to help your patients, I have to also use my common sense. People are sicker now than they have every been. As we have moved away from traditional diets (many high in saturated fats), people have become even more unhealthy. There are numerous studies that suggest that low carb diets (which tend to be high in saturated fats) not only don’t raise blood cholesterol, they have several beneficial impacts on cardiovascular disease risk markers. People in our culture eat a lot of carbs and this has had a very negative effect on health. Nutritional definciencies, inflammation, disrupted gut flora, and high blood sugar levels are a much bigger problem than eating some eggs and butter. I think there is much more to this conversation. And we are all unique individuals. We all respond differently to different diets. And blaming saturated fats and cholesterol on the cardiovascular crisis we are having is short-sighted and incorrect. If this was the case, we would be seeing people heal and get better, but unfortunately, people are just getting worse as doctors continue to give false information. I research a lot and have seen many many many people in my own life benefit from transitioning to a real food, whole food, traditional diet that does include saturated fats and other healthy fats like coconut, olive, avocado, etc. If you take a look around, people are not well. And it is NOT because they are eating saturated fats. It’s living a sedentary life, eating too many processed carbs and sugar, and being exposed to endocrine disruptors every day all day. I get that changing gears is hard. But at some point, physicians will have to get on board and admit that eggs and butter and beef are not the issue. Those are real foods. The UNREAL foods void of nutrition that people consume daily are the problem. I guess I had to hear it one more time, or maybe it was the way you said it. It’s information that we’ve all known for a long time but I would cheat here and there and use it for cooking. Thanks for the refresher, and the detailed information about saturated fats. And I do love the softly sweet smell of cooking with coconut oil. I’m Greek and here olive oil has been used in cooking since like forever… We in my family cook always with olive oil because flavour is an important factor.There is no mediterranean cuisine without olive oil. Lentils, beans, stews, pitas, casseroles if cooked without olive oil are just not the same, not my granma’s recipe. BUT we never use olive oil when frying, it’s considered too heavy, the taste and the smell are overwhelming when olive oil is heated that much. Plus here we have decent olive oil, the price range on the self corresponds to the quality. There are studies from european institutions that rate the three top olive oil producing countries with flavour and quality being thepoint of reference.Greece comes first, followed by italy and spain.Sorry for such long a reply but i know people cooking with olive oil since forever who are now more than 100 years old. Just wanted to share my thoughts! How do we know which olive oils are REAL? That’s a really good good question. Unless you know the source personally, there is no guaranteed way to know. I have been buying from a local source who has let me visit their farm. There are some online articles that claim you can tell by putting it in the fridge and if it totally solidifies, it’s real. Not totally certain this is accurate. That’s why I stick with my ghee and coconut oil. I own an olive oil specialty store and we have certifications on all our olive oils and that’s how you can tell they are real. The certifications show the chemical content of the oils and when the olives were crushed. I wouldn’t trust what is in the grocery store but trust the specialty oil stores. They can prove it! As for cooking with olive oil, I disagree with you. As long as you do not cook over medium high heat, you start the food at the shimmer stage of the oil heating, and you do not overcook your food, it is perfectly fine. It is only in large commercial kitchens that frying with olive oil has ever created trans fats in olive oils and it is not a concern in the home kitchen. While you do not have the same optimum health benefits of olive oil eaten raw, it is a heck of a lot better than using canola oil, vegetable oil, and other man made oils. So I have used butter and olive oil pretty much interchangeably, oops. That will probably change now. But what about using grape seed oil for cooking? Where does that fit and is it pretty much the same thing as olive oil? The best oil for cooking is palm oil. Tropical traditions offers a good palm oil, as well as coconut oil. If you use olive oil, don’t use virgin for cooking. 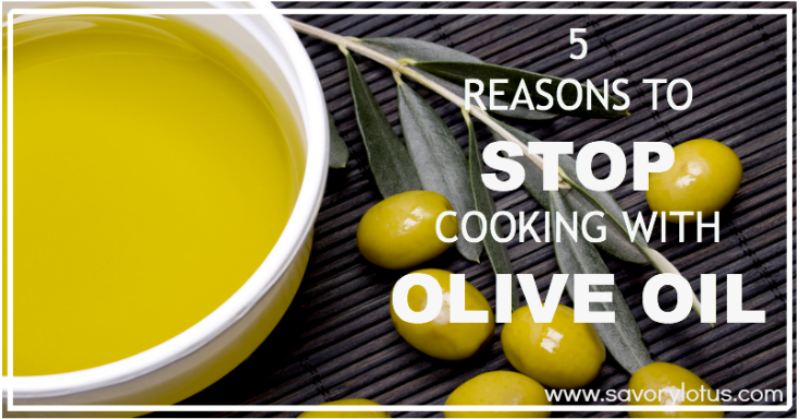 Use plain olive oil that has a much lower polyphenol content. Personally, I like bacon fat the best. Isn’t palm oil horrifying for orangutans? What about macadamia nut oil? I have read it has great health benefits. I put it in smoothies, but have never cooked with it. Do you know if the nutrients are destroyed with heat like olive oil? I may have to give it a try! Hmm, that was an interesting read, really made me think about using some other kind of oil. In your opinion, is coconut oil a good replacement? I wanted to try it out for a long time, maybe it’s the perfect time to change. I learned not to cook with olive oil way back in organic chem 10 plus years ago. When heated up too much the chemical composition changes and it is no longer healthy for you. Olive oil using at room temperature on salad or vegetables after they are cooked but it should not be heated to high temps! Want a doctor that agrees? Look up Gundry. Unless you heat it beyond the smoke point, heating olive oil makes it a little “less good”; it doesen’t make it dangerous. I consider that you have five things that happen when olive oil is heated but none of them are a reason to stop cooking with it. I also use it in my home-made salad dressing. I a linking to your article when encouraging people to use high heat oils for cooking! Thanks Katja! So many nay sayers here trying to discredit the article… so sad. An Italian once laughed at me and said Americans are crazy for cooking with olive oil when I told her I did. This article is correct and the olive oil industry was caught in a scam of selling gmo canola, soy and other unhealthy oils as cold pressed olive oil. And cooking with it destroys its healthy benefits. So why do you insist on wasting your money when there are healthy choices to cook with? excellent article. the naysayers are just arguing to their own detriment. If they would research it they would know you are right.